Our guests always look forward to evening dessert at Lucille’s. 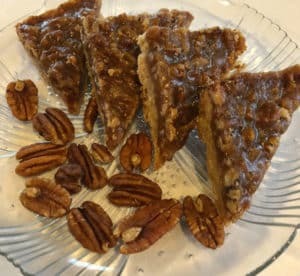 These Pecan Bars were a recent offering and a definite hit. They have the deliciousness of pecan pie with a super easy (no roll!) crust. Thanks to the Just a Taste blog for the recipe. Line a 9” x 13” pan with foil, leaving enough for a 2-inch overhang on all sides. In a large bowl with mixer, cream together the butter and brown sugar until fluffy. Add the flour and salt and mix until crumbly. Press the crust mixture into the foil-lined pan and bake for 20 minutes until golden brown. While crust bakes, combine the butter, brown sugar, honey and heavy cream in a saucepan and simmer for 1 minute; then stir in pecans. Remove crust from oven—do not turn off oven. Immediately pour the pecan filling over the crust, spreading it to cover the entire surface. Return pan to oven and bake an additional 20 minutes. Remove pan from oven and allow bars to fully cool in the pan. Using the foil overhand, lift bars from pan and transfer them to a large cutting board. Peel off foil and slice bars. Once you’ve enjoyed these, plan a visit to Lucille’s Mountaintop Inn & Spa and you can enjoy a special dessert every night, plus a delicious breakfast each morning. Call today, or book your stay online! This entry was posted in Food and Drink, Georgia Bed and Breakfast, Georgia Mountains, Holidays, Recipe and tagged Georgia Bed and Breakfast, Lucille's Mountaintop Inn Recipe by admin. Bookmark the permalink.